I am sure by now you have all probably heard about some of the new storage features introduced in vSphere 5.5 such as Virtual SAN (VSAN) and vSphere Flash Read Cache. In the coming weeks, I will be working on a series of articles that will be looking at these new features from an Automation perspective and demonstrate how you can automate and manage these configurations using the vSphere APIs. This of course will then allow you to automate using your favorite scripting/programming language such as PowerShell, Perl, Java, .NET, Ruby, etc. In this first article, I will be exploring the new vSphere Flash Read Cache APIs and I will be primarily focusing on consuming vSphere Flash Read Cache for your virtual machines and not on the actual ESXi host configurations. In a subsequent articles, I will look at the necessary APIs to configure vSphere Flash Read Cache for your ESXi 5.5 host. 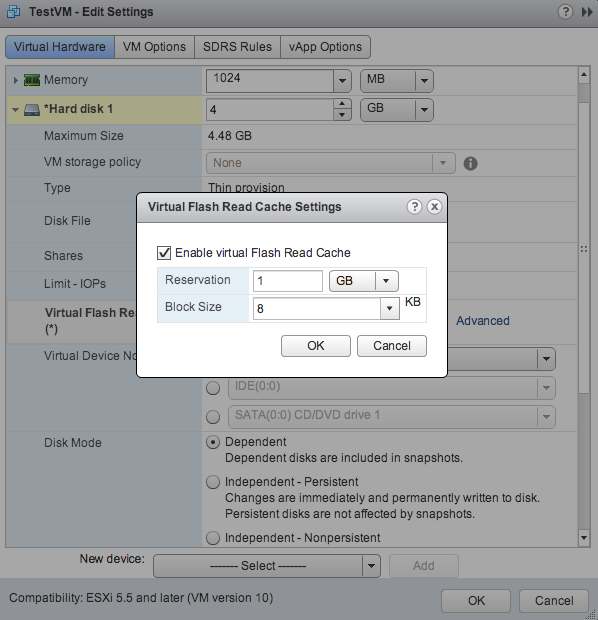 For those of you who are not familiar with this feature I would recommend you check out Duncan Epping's introduction article to vSphere Flash Read Cache also known as vFRC as well as the new What's News vSphere Flash Read Cache whitepaper by Rawlinson Rivera. To enable vFRC for a particular virtual machine, you will need to use the virtual machine ReconfigVM_Task() method and specify the particular virtual disk you wish to enable vFRC on. There is new property in the vSphere 5.5 API called vFlashCacheConfigInfo under the VirtualDisk object which you will need to configure. Technically speaking, you only need to specify the reservationInMB property as the rest of the properties have system defaults. However, at a minimum you will probably want to configure reservationInMB and blockSizeInKB where the valid values are 4-1024 and the system default is 4KB. For cacheConsistencyType, even though the vSphere API mentions both "strong" and "weak" type, only "strong" is supported/configurable and this means that the cache data will be consistent upon a crash. If you try to configure it to "weak", you will get a not supported error. For cacheMode, even though the vSphere API mentions both "write_thru" and "write_back", only "write_thru" is supported/configurable and this means that when writes are written to the cache, they are then de-staged to the underlying storage sub-system. If you try to configure it to "write_back", you will get a not supported error. The last property vFlashModulespecifies the specific vFRC module to be used and at this current time, only "vfc" is valid and this is also a system default and does not need to be specified. To demonstrate these new vFRC VM APIs, I created a sample vSphere SDK for Perl script called vflashVMMgmt.pl which can run against a vCenter Server or a standalone ESXi 5.5 host. The script supports three operations: query, enable and disable. Hopefully this has given you a good overview of the new vSphere Flash Read Cache APIs from a virtual machine perspective and the necessary information to enable or disable this feature. In the next part of the series, I will take a look at the new vSphere APIs that are required to setup and configure vFRC for your ESXi host, so stay tuned!